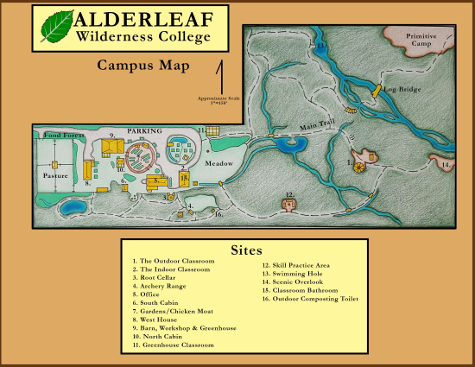 The Alderleaf Wilderness College campus is nestled in the foothills of the Cascade Mountains. It is located above the Skykomish River valley between the towns of Sultan and Monroe, Washington, about 30 miles northeast of Seattle. Our 24 acres of property is an evolving model of environmental sustainability. Most of our courses take place on site. Watch this virtual tour of the Alderleaf Campus and/or scroll below for more details, a map, and information on our permaculture site plan. 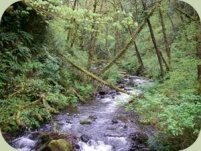 The forested portion of our land contains giant mossy cedar and hemlock trees, a large cascading creek, a diversity of wildlife, numerous trails, tenting sites, and our outdoor classroom. It is adjacent to thousands of acres of forest lands with many lakes, streams, and mountains. We're fortunate to have the foothills of the Cascade Mountains in our backyard. The Alderleaf land also houses our classrooms and office, as well as our small farm which is integrating permaculture principles. The farm includes two cabins, two houses, a large barn, beautiful pastures, ponds, garden space, chickens, sheep, and fruit trees. Residents include interns, instructors, and students in the Wilderness Certification Program as well as others interested in being involved with Alderleaf Farm. Residents share a passion for nature, sustainability and community, and often enjoy the opportunity to grow organic food and steward the land. 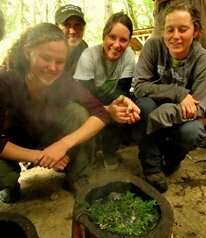 Alderleaf Farm Permaculture Plan: Interested in learning more about our sustainability projects? 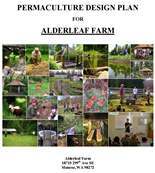 You can download and view a copy of our most recently updated permaculture plan for Alderleaf Farm (in PDF format). It describes the history, current features, future plans, care, implementation, and other key information for working together towards our vision of sustainability. Interested in visiting Alderleaf? Contact us to schedule a tour.